Healthy Gluten-free Vegan Baked Falafel! The perfect quick & easy meatless dinner recipe! They’re gluten-free, dairy-free, vegan & freezer-friendly! Happy Meatless Monday! I’ve mentioned before that I’m a veggie-lover living with a family of carnivores…so when I create a vegetarian recipe that fulfills my meat & potatoes-loving hubby…I know it’s worthy to share with all of you! 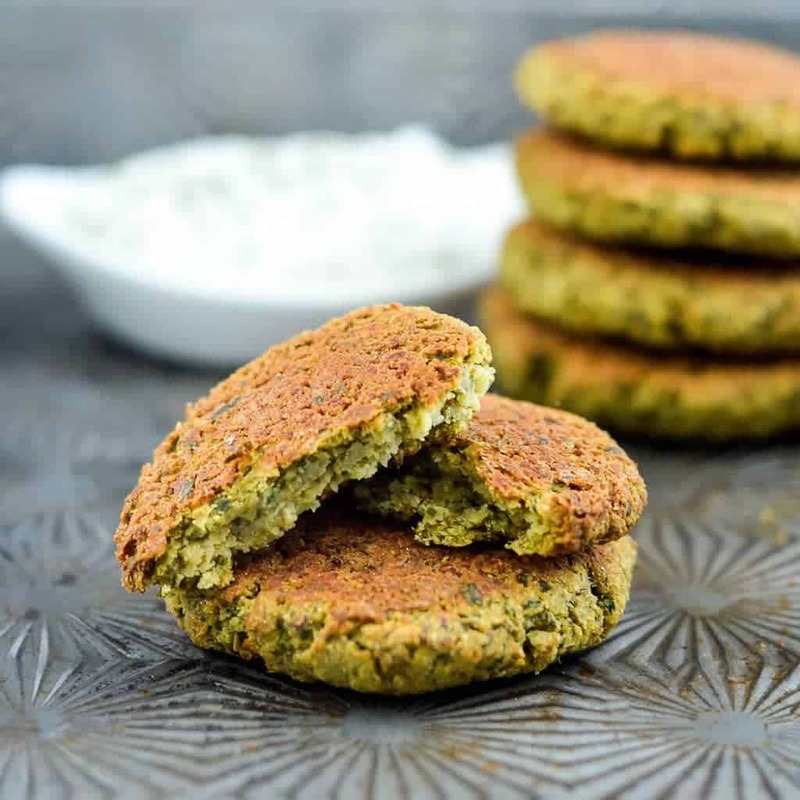 This recipe for Vegan Baked Falafel is gluten-free and dairy-free! It’s a recipe that has been years (seriously years) in the making! After countless trials and errors, I’ve finally hit the falafel jackpot! So let’s jump right in with some step-by-step instructions on how to make this recipe! 1. 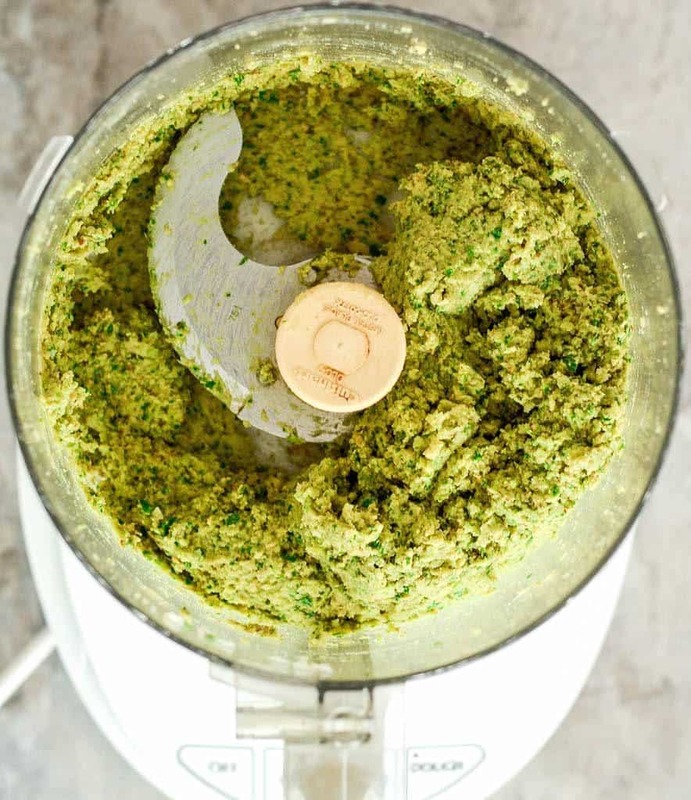 Use a Food Processor! 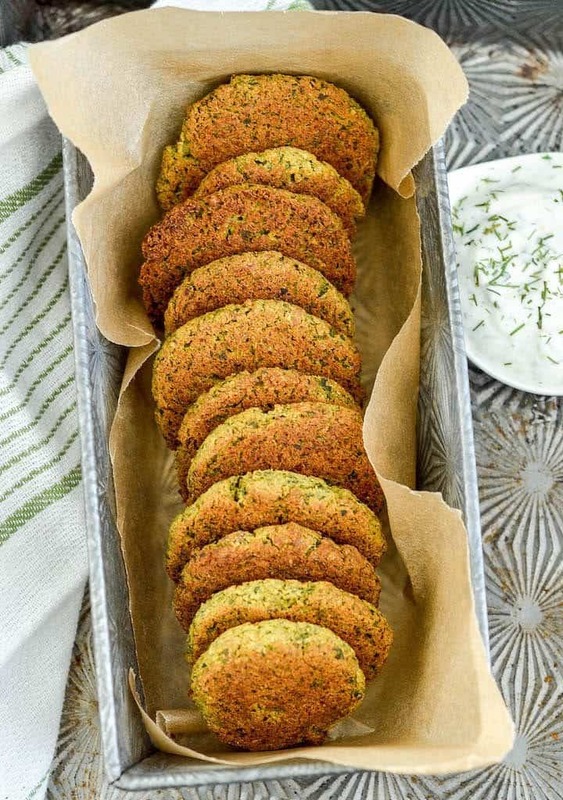 This Vegan Baked Falafel recipe is best when made in the food processor. Start by processing the chunkier ingredients (chickpeas, herbs, & onions). 2. Grease your pan well! The next step is super important! To keep your Vegan Baked Falafel from sticking to the pan, you need to grease it with olive oil (not nonstick spray). Simply “glug” about 1 TBS of olive oil onto the pan and use a spatula (or your fingers) to spread it around. This ensures that there is a sufficient amount of oil to crisp the falafel and make it easy to flip halfway through baking. When I was pregnant with my son I craved falafel all.the.time. I ate at a local Lebanese restaurant at least once a week (no joke) because I hadn’t yet perfected the art of falafel-making! Plus, they had the best pillowy-soft pita bread in the history of the world (still haven’t been able to duplicate that one yet)! However, we moved way from Chicagoland and all the glorious dining options I was so accustomed to. 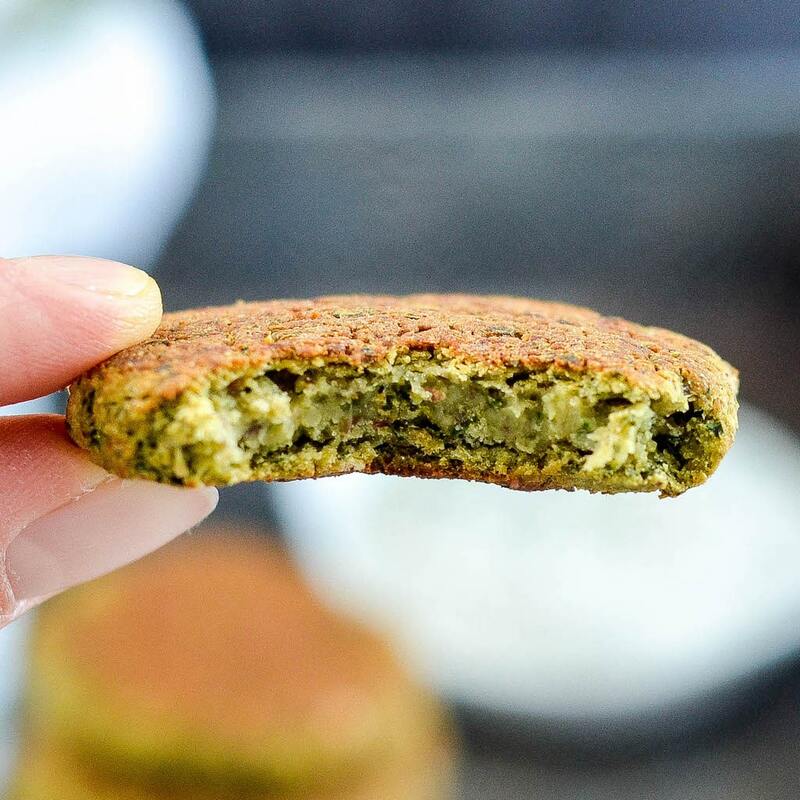 Since moving to Salt Lake City almost 3 years ago, I have yet to find falafel that even comes close to what I could get back in Chi-Town…so I made it my mission to create this delicious and healthy recipe! This Vegan Baked Falafel is completely gluten-free and vegan! It’s a perfect entree served with tzatziki sauce, in a pita or on a salad! Like I said above, I tinkered with this recipe for years before I got it to be exactly the way I like it! So there are only a few substitutions I could recommend! White onion. Any onion works well in this recipe! I have used red, white, and yellow all with great results! Garlic powder. If you are a garlic lover, I recommend substitution fresh minced garlic for the powder. Olive oil. Any neutral oil works well! I recommend olive oil or avocado oil! 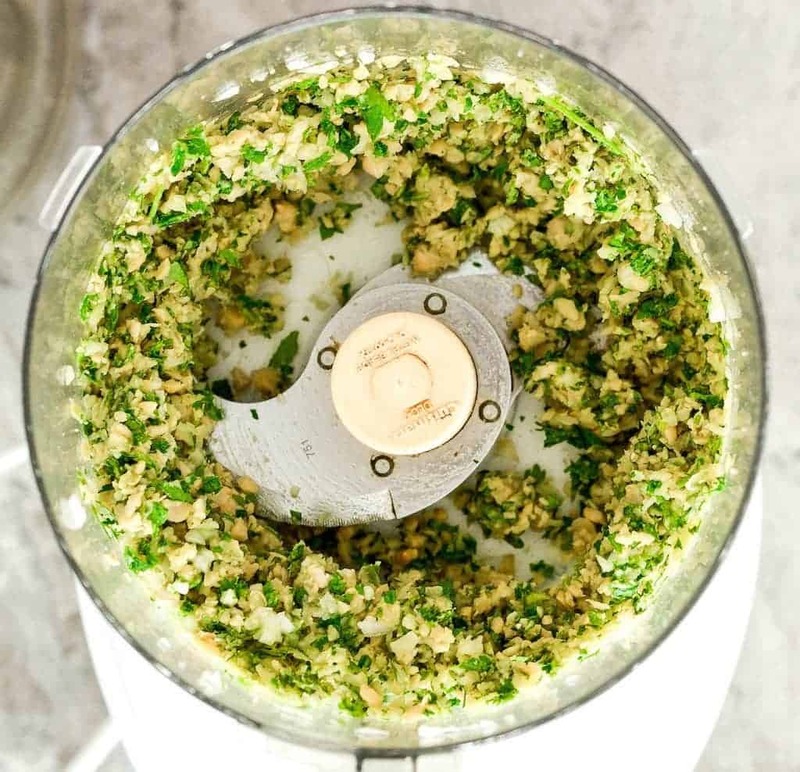 Add chickpeas, onions, parsley and cilantro to your food processor fitted with an “S” blade. Process until well combined (but still chunky). Add salt, pepper, garlic powder, coriander, cumin, baking powder and flaxseed. Process until well mixed and fine. (mixture will ball up in the processor). Generously grease a large baking sheet with oil (olive or canola). Roll about 2 TBS of falafel mixture into balls and then flatten into discs and place on baking sheet evenly spaced. Remove from oven and serve with tzatziki sauce, in a pita, or on a salad! These freeze very well! Simply reheat in the oven when ready to eat! Do you love falafel? Do your kids have strange favorite foods? I hope you all have an amazing Memorial Day! It’s my sweet baby girl’s 1st birthday today (insert LOTS of emotions). I’m so grateful I get to be her momma. More on her to come later this week! I can’t believe my Naomi is ONE. Falafel is one of those things that I always get if it’s on the menu! I have attempted it at home quite a few times, but it has never worked out right. I’ll have to give yours a go and see how I do. 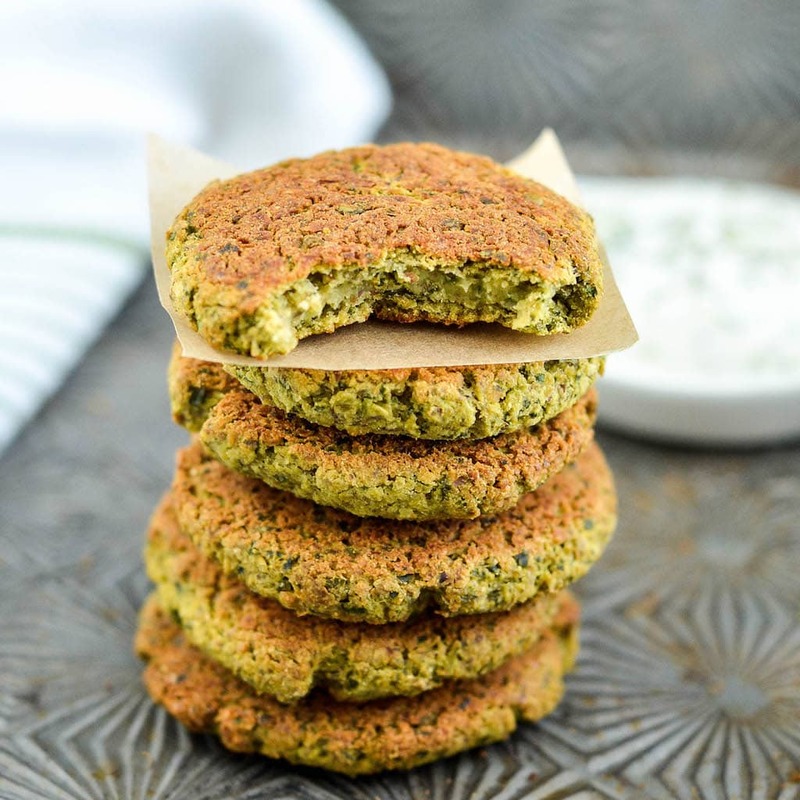 I loveee falafel and these look absolutely perfect! I agree! Falafel is one of my favorite foods! 😉 Oh those carnivores….LOL! I’ve been craving falafels lately so this recipe came at the perfect time! These look delicious. I am very excited to give them a try! I love falafel but I’ve never made it. I guess I always thought it was too hard to make but you proved me wrong! This looks so easy and delicious! Yum!!! Falafel is one of my favorites, either on a pita or even on top of a salad! Yours looks great! We have recently fallen in love with falafel and so I am now going to try a homemade baked version! Thank you! It’s SO delicious!! I love that everyone from my baby to my husband can & will eat it! 😉 Thank you! I’m the same way… I love vegetarians meals and all my husband wants is meat!! These look wonderful! Wish I had seen this earlier! I made falafel last night but yours look way better than mine!! Mmmmm, this looks so delicious. I’ve never attempted to make falafel before. I should give this a whirl. Thank you so much! I hope it goes well for you if you give it a try! 🙂 Have a great weekend! Your Baked Falafel looks delicious, I love it! Thanks so much for sharing with Full Plate Thursday and have a great weekend! Falafel is just the best! Love your nice and simple recipe! 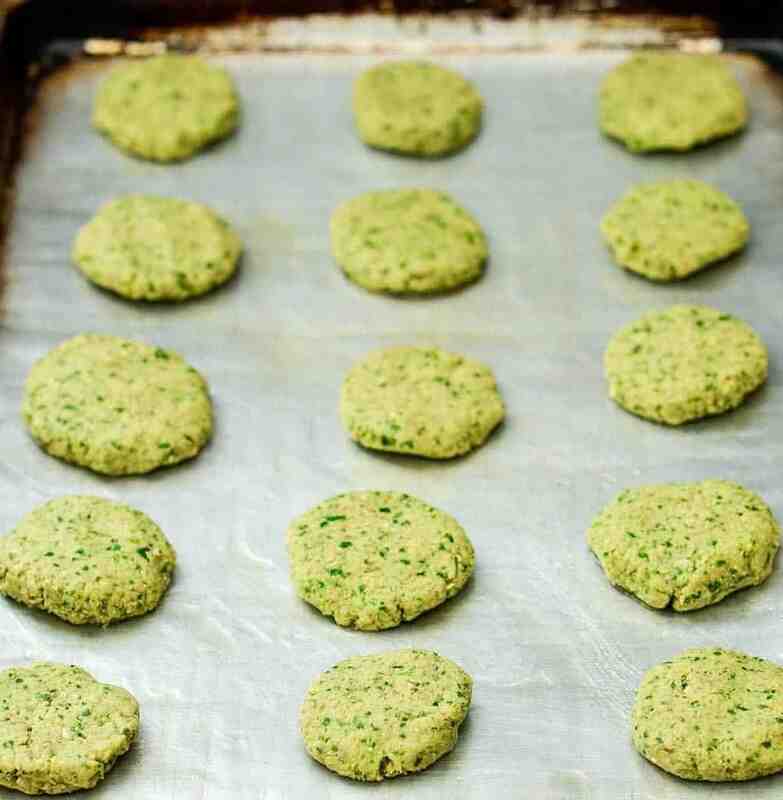 I love falafels, great to find a recipe for a slightly healthier version that the fried ones! I am a big fan of falafel and I can be found munching on falafel delights at least twice a week. I’m so glad to see your vegan and gluten free recipe. I am featuring this at the Healthy Living Link Party! Thank you so much Deborah! 🙂 Falafel really is super delicious! 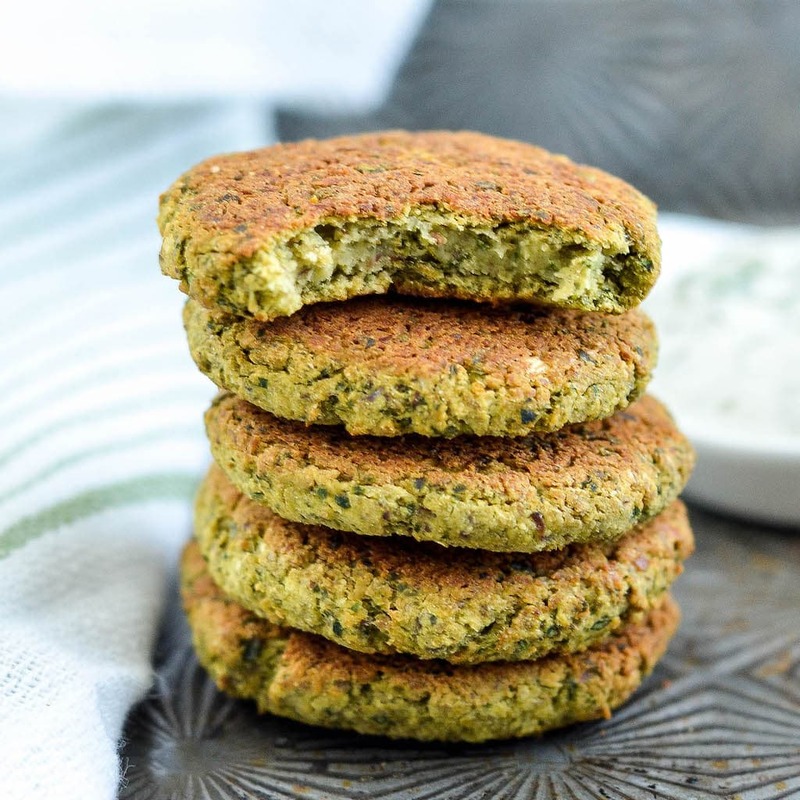 I gave this recipe a go today, and this is honestly the best falafel recipe I’ve ever tried – others are too dry or fall apart too easily, but these were just perfect, thank you for sharing! These look amazing! Can I use eggs instead of the ground flaxseed? Or chia seeds? And if so, how much do you recommend to substitute? Hey Holly! Honestly I have never tried making these with anything other than ground flaxseed! If you need a substitution chia seeds could work, but I would grind them into a powder in the blender before using them, although again I haven’t tried it so I cannot guarantee how they will turn out with a substitution! AMAZING!!! I’ve been vegan for 9 years and this war my first try at Falafels! Thank you for the awesome recipe! I’m going to try and veganize tzatziki sauce, any ideas will be greatly appreciated! Made this and loved it – I only wish I had a bigger food processor so I could make more at once. Even my onion- and cilantro-hating husband is already asking me to make it again, and my daughters (two and four) devoured it as well. Thanks! It was so nice to see a few comments from people who actually MADE the recipe – and enjoyed it. I’m so tired of reading about how good someone thinks a recipe LOOKS! Made this recipe and it was delicious! I used to work at a falafel shop and have been craving some falafel throw backs, but don’t have a deep fryer. Made this just now. The mixture was very dry. Baked them and most fell apart during flipping, crumbled. I didn’t want to give up so ate the few that made it and they were very salty tasting. Help! I so wanted this to work! Hey Meredith! OH NO! Did you make any substitutions? Did you use cooked, canned chickpeas? I’m so glad you loved this recipe! It’s one of my favorites!!! I can’t stand dhania (what we South Africans call fresh coriander / cilantro leaves). Can it be omitted or substituted for anything else like celery or spinach? Hey Micky! You could try omitting the cilantro! It does impart a pretty critical flavor in the Falafel, but if you don’t like it you could just increase the parsley or add spinach! I made these falafels last week, and they turned out perfectly! Thank you for a healthy and delicious version of a favorite dish! I made this and it was TOO SALTY! I had to throw them out. I remade a double batch with 1/2 tsp salt and it was much better. Hey Ali! I’m so sorry that happened to you! Did you use sea salt or iodized table salt? I made these and only ended up with eight falafels, even though I portioned the patties with 2 tablespoons each? Did i do something wrong? Thanks. Hey Noah, it’s possible you made them thicker? However without being in your kitchen and watching you make them I can’t say for sure! Hmm! Good theory on the baking powder! I think the main culprit is probably that some people aren’t using Sea Salt, and instead are using table salt (iodized). It’s also possible that some canned chickpeas are saltier than others! hi there! could someone tell me, what 1 15 oz can would be in grams? Thank you so much!! One 15 oz can is 425 g, but that is before draining I believe. I made these last night and they were amazing! My husband even enjoyed them and he is not a fan of vegetarian meals. I’ve made other Falafel recipes and they never turn our well. I also love that these are baked and not fried. Thanks so much for the recipe! I’ll be making them again this week! How well does this recipe reheat? Want to make this for Easter Sunday for your sister but want to make ahead? I usually recommend reheating them in the oven! Or just mixing the “dough” together the night before and baking the day of!